Use new cables for safe and smooth operation. 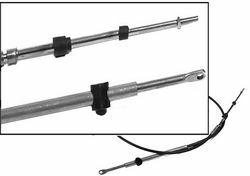 Factory Mercury Marine control cables fit Mercury Outboards and Mercruiser Sterndrives. They also fit Force, Sport Jet, Mariner and other applications. Quality construction for exact fit and long life. Most cables have a part number and length stamped near one end or the other. Some lengths are designated in inches. For example, 0180 would equal 180 inches or 15 ft. Different Remote Controls use different control cables. If you are not sure how to identify your remote control, send us a couple of photos. If measuring for new cables be sure to allow for smooth gradual bends and loops. These cables have the traditional Gen 1 control end and a threaded SAE engine end. Available in 1 ft.increments up to 30 ft.
All cables are priced individually and packaged one per box. (Japanese origin) and various Mariner 8 thru 60 hp. outboards (Japanese origin). This type of cable does NOT have an adjustable barrel. Available in 1 ft. increments up to 30 ft. and 2 ft. increments over 30 ft. These cables are use for Gen 1 Merc, Mariner and Mercruiser applications. WILL NOT fit new Gen 2 controls. This type of cable has an adjustable barrel. 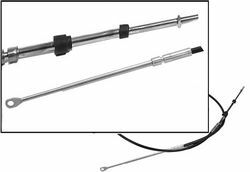 Follow your Service Manual for proper cable installation and adjustment. Smooth operation because of stranded SS core and plated brass ends. High Performance for extreme conditions. Tight tolerance with 16 wire outer sheathing. Sealed lubrication system. WILL NOT fit new Gen 2 controls. 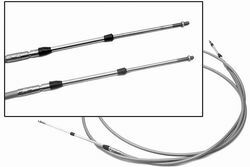 Throttle and Shift Cable has standard stainless steel core with 16 lay solid core wire. Control end has a Gen II type connection and the engine end has a standard threaded end. Must be used with a Gen II remote control. Fits Mercury Mariner 4/5hp. Model year 1987 and newer 4/5/6hp. FourStroke Model Year 1999 and newer, 8/9.9hp. FourStroke Model year 2005 and newer outboards and Mariner 8 thru 60hp outboards of Jaoanese origin. Available from 5 to 30 feet in 1 foot increments. These cables are used with Mercury Gen II Remote Controls only. Durable operation at a great price. and up to 70 ft. in 2 ft. increments. These Premium Gen II cables will only ft Gen II Remote Controls. Built with stainless armour wrap and plated brass ends. Platinum Gen II cables only fit Gen II Remote Controls. These are typically used in extreme applications where tight bends are needed. Very smooth for complete and accurate control. SAE threads on both ends. Used with many Morse and Telflex remote Controls. Commonly used in direct inboard applications. Available in 1 ft. increments up to 30 ft. and up to 70 ft. in 2 ft. increments. Smooth operation, perfect for extreme runs and conditions. Plated brass ends prevent corrosion. Select Designed for smooth operation to prevent stalling. These cables run from the drives bellhousing to the shift plate assembly on the engine. Provided in Kits with misc parts. Select Keep your Bravo shifting smooth with factory Mercruiser cables. Cables come in Kits with other parts required for a complete installation. Select We have single and twin remote controls. See the new smoother Generation II Remote Controls.